In an event sponsored by The Stranger and Washington Bus, Jenny Durkan said "colored person" during a skit while roasting her opponents in the style of comedian Melissa McCarthy impersonating White House press secretary Sean Spicer. Bob Hasegawa blew vape smoke out of a flute and Jessyn Farrell played George Michael‘s “Careless Whisper” on a saxophone. 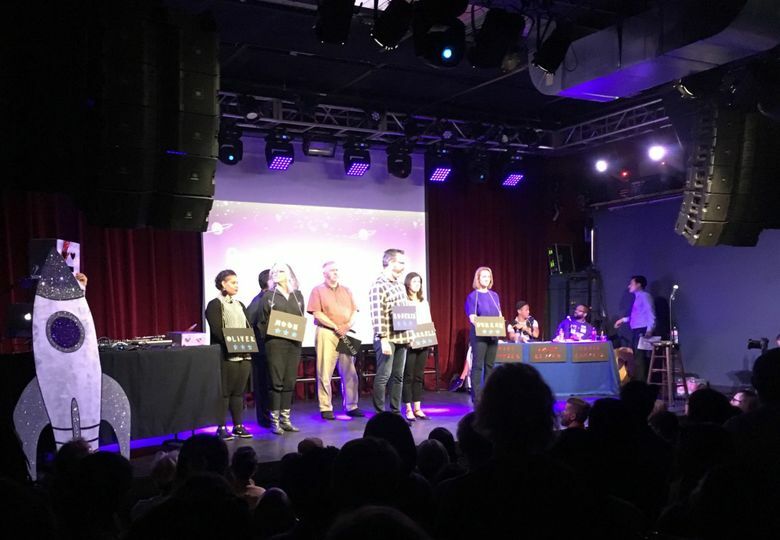 But Nikkita Oliver won the “Candidate Survivor” mayoral forum and talent show hosted by The Stranger and Washington Bus on Tuesday night, as a young Capitol Hill crowd voted by text. In 2013, the last time the event was held, then-Mayor Mike McGinn won. This year, he was eliminated after the first round. A cringe-worthy moment was Jenny Durkan using the term “colored person” during a skit. The former U.S. attorney was roasting her opponents in the style of comedian Melissa McCarthy impersonating White House press secretary Sean Spicer. “You want to talk about racial, social justice and racial discrimination? Try go shopping for a freaking doll of a colored person. It doesn’t work,” Durkan said. A judge of the event afterward reminded her to use the term “person of color,” and Durkan later apologized to the crowd, calling it an accident. “Sean Spicer took over my brain for a minute and the script,” she said. Before displaying their talents, the candidates largely agreed on a number of substantive issues. Durkan set herself apart as the only candidate to support building a juvenile-detention center and to say she’d continue the city’s sweeps of unauthorized homeless encampments.